Awarded Best New Performance Products of 2004 by RPM Motoring Monthly! I have original GM side pipes on my 1966 461 (427 with 454 crank and 30 over) and have 331hp and 431 torque at 4900 rpm on a chassis dyno. Is it reasonable to expect a considerable gain from an after market side pipe that will fit under the stock shield and if so, which one? I figure at 22% loss though the drive train and factory side exhaust would gross 425hp and 553 torque (times 78%) and net the above figures. Is that a reasonable guesstimate? How much loss can be attributed to the side pipes alone? Thanks for any opinions and comments. Try Classic Chambered Vettepacks 3 1/2 x 2 1/2 model no 2540VP. They produce a deep, mellow sound. They are noticeably deeper toned than stock sidepipes, and are quieter while cruising. They do BARK loudly when you step on the go pedal. 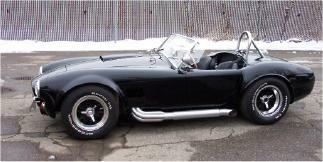 Cobra Kit Car with a 498 Shelby aluminum block 427.
noise level tests per the Australian federal qualification procedure, back pressure and RWHP with the Gtech. After installing the 2.5” VettePack Mufflers, the change was immediately noticeable, normally I would have to give the car a little extra throttle to keep it running for the first minute or so; with the new pipes it just started and kept running without any extra throttle. I then took the car out for a run, the exhaust noise was obviously lower and upper rev limit moved from about 5,500 to 6,500 plus, I took it out to 6500 easily but was not prepared to go beyond that. The Gtech indicated that I had picked up 33 RWHP. The exhaust back pressure dropped from 9.5 psi at 5500 rpm with the stock side pipes, to 2 psi at 6000 in 4th gear with the VettePacks. Over the Xmas break I re did the noise test and had an average reduction of 10 dB in the region above 200 Hz (cycles/sec). This amounts to a subjective halving of the noise in this band of frequencies, the nasty harsh bark in the upper rev range was gone. These results were confirmed less formally by the locals, who commented on how much better the car sounds. Just for reference my 66 is running a fuel injected 383, custom extractors and a crossover pipe located just below the collectors. I have been looking for years for an acceptable solution to my stock side pipes noise and restriction problems; your VettePacks meet or beat every performance spec I had on my wish list. By the way many thanks for jumping through all the hoops to get the pipes out to me here in Australia. Best regards and thanks, Richard P.